Contoured backside allows fitment directly over most shock absorbers, allowing saddlebag options on bikes that were previously limited due to shock and turn signal placement. Made of rugged leather-grain Saddlehyde with reinforced panels. Streamlined shape allows stock turn signal locations to be used; turn signal relocator bracket included for harder-to-fit bikes. 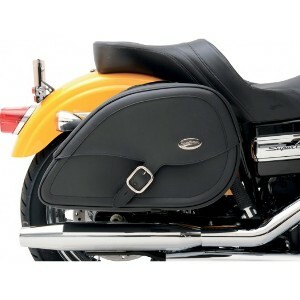 Clean-styled saddlebags feature chrome buckles and stylish straps with quick-release hidden buckles. Install using one of three methods: zippered yoke for over-the-fender mounting, hard mount bags using included S4 saddlebag supports or use with Saddlemens S4 Quick Disconnect Mounting Kit (sold separately) for a custom. Mount that allows bags to come off in seconds. Zip-off yoke mounting allows bag to be disconnected without removing the yoke. Include solid adjustable S4 saddlebag support mounting brackets and hardware.